For today’s fast-paced, dinner-in-an-hour kitchen, an instant hot water dispenser offers the epitome of convenience. An instant hot water dispenser accelerates all kinds of kitchen tasks, from preparing hot drinks, soups,and sauces to warming baby bottles. It even melts wax and purges berry stains from clothing. 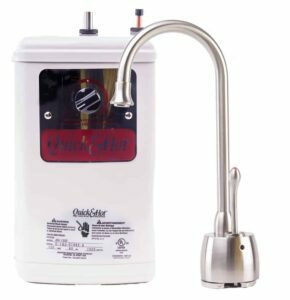 Instant hot water dispensers take the lag time and the hassle out of many chores that used to require boiling water on the stove. How much does it cost to keep the hot water ready and waiting? 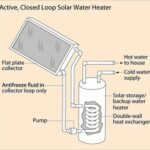 The usage is a little more than 1/2 kilowatt hour per 24 hours, which, depending on your local electricity rates, equates to about 6 or 7 cents a day. • Countertop electric kettles and dispensers. For more about these, please see Countertop Instant Hot Water Kettles & Appliances. This type of instant hot water dispenser is a point-of-use water heater. It is a miniature electric water heater with storage tank inside the unit. The tank connects to a small sink-top spout that serves up the heated water. Many instant hot water dispensers also connect to a water filter. Or you can get a hot cold water dispenser that delivers both hot and cold water at the sink. Products sold by different manufacturers vary only slightly. Inside the compact unit, all have an interior tank that holds water, and an electric heating element that heats the water. Types with a stainless steel interior tank will last longer than lower-priced models with a rubber bladder tank. A control dial on the outside of the unit allows you to tweak the temperature or turn the unit off. Instant water dispensers have a thermostat that automatically shuts off the heating element when the water in the tank reaches the set temperature. For more about how they work, see How a Hot Water Dispenser Works, below. If you’re going on vacation or you’ll be away from the house for more than a day or two, turn the control dial off so you don’t waste energy maintaining hot water in the unit. The most common part to fail is the thermostat. If it goes out, fixing the problem is more hassle than it’s worth. You’re better off just replacing the water dispenser if or when this happens. 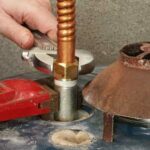 Thanks to quick-connect couplings, you can usually change-out an instant hot water dispenser tank in less than an hour. 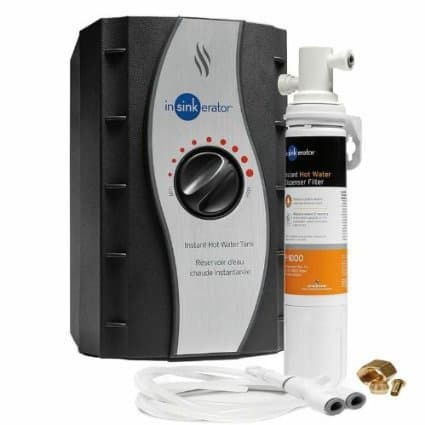 This top-rated instant hot water dispenser tank includes an inline filter. Tanks vary in size and by the heating elements’ wattage. Most are 1/3- or 1/2- gallon and range from 500 to 1,300 watts. A 750-watt, 1/2-gallon tank will produce up to 60 cups of hot water per hour. Higher wattage tanks can deliver up to 100 cups. Most makes have a dial for fine-tuning the temperature up to 190 degrees F, and must be plugged into a 120-volt electrical receptacle. Though units sold through specifiers such as designers, kitchen shops, and wholesale plumbing houses are generally installed by plumbers, those sold through home centers and hardware stores and online through sites such as Amazon. A tank-style instant hot water dispenser is one of those items that you might as well buy online—appearance doesn’t really matter much because the tank sits hidden under the sink. In addition, online resources make comparing specifications easy. Furthermore, online prices tend to be significantly lower than retail store prices, and you can save a trip to the home center by having the small appliance delivered. On this page, you’ll find links to Amazon, where you’re likely to find some of the best prices. Waste King instant hot water dispenser with a sink-top spout. Given the similarity of products, when shopping for a new instant hot water dispenser, focus on price, availability, and warranty. Note that the price often does not include the sink-top spout. Spouts are discussed below. Popular makes available on Amazon include: Everpure, Waste King, and InSinkErator. A best seller is the InSinkErator HWT-F1000S (shown above), which has a stainless steel tank and also a filter that connects to the faucet. Tank warranty is for 3 years. Because the sink-top spout is the only visible part of an instant water dispenser, manufactures offer many styles and finishes. 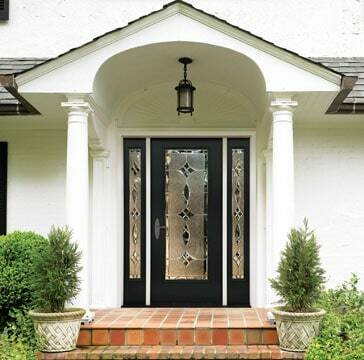 Typical finishes include white, black, almond, chrome, satin nickel, and brass. In terms of style, you’ll find everything from low spouts with handles you twist to tall, gooseneck units that allow plenty of room for filling tall cups and kettles. As a result, chances are good that you can match the look of your sink fixtures. 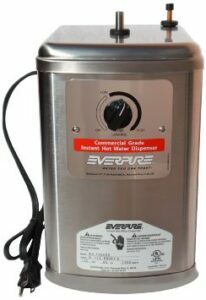 Everpure instant hot water dispenser tank goes in the cabinet under the sink. Some units, such as KitchenAid’s and Whirlaway’s, have a twist grip that releases water with a quarter turn. In contrast, others, such as InSinkErator’s, have a lever release. Elkay’s spouts, which tout “no lead” construction, have a button on top. Franke makes the smartly styled Little Butler, which has a tall, L-shaped spout and a lever handle. Some manufacturers—Franke and InSinkErator to name two—offer models that dispense both hot and cold water through one faucet. The cold water side can be connected to a chiller or the refrigerator. Both supplies can also connect to a water treatment system. This type of faucet eliminates the need for yet another spout—the purified cold water spout—at the sink. If you want instant hot water but you don’t want to mess with the plumbing, see Countertop Instant Hot Water Kettles & Appliances. Instant hot water dispensers are simply miniature electric water heaters that serve a single faucet. A small, under-sink tank heats and holds nearly boiling water, ready for steamy delivery through a sink-top spout that’s separate from the main tap. 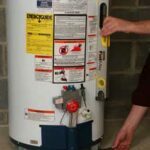 Unlike a conventional water heater, however, the tank never becomes pressurized. The system hooks up directly to a cold water pipe under the sink; incoming water travels through the body of the spout and into the tank, where it’s heated by an electric coil. The heated water expands, filling an expansion chamber in the upper part of the tank. When the faucet is turned on, more cold water is released into the bottom of the storage tank, displacing hot water in the tank and expansion chamber and forcing the heated water up through the faucet. The spout delivers water more slowly than a typical faucet does, and the water is much hotter than a standard hot water tap’s—about 190 degrees F. instead of 120 degrees. The heated water arrives immediately; you don’t have to wait for it to warm up. An adjustable thermostat controls water temperature with most models. Adjustment is needed only if the water is too cool or if it’s so hot that it boils away, causing the tank to overheat. 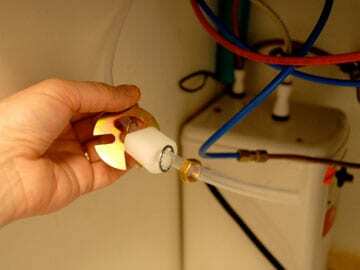 (To prevent damage, the tank should be protected from overheating by a replaceable thermal fuse.) Noteworthy: It’s a good idea to turn down the dial or unplug the unit when you go on vacation. Tanks vary in size and by the heating elements’ wattage. Most are 1/3- or 1/2- gallon and range from 500 to 1,300 watts. A 750-watt, 1/2-gallon tank will produce up to 60 cups of hot water per hour. Higher wattage tanks can deliver up to 100 cups. As with any water heater, hot water dispensers may accumulate scale in regions of the country that have hard water. Some units have drain plugs at the bottom to allow you to drain the tank once or twice a year. Waste King instant hot water dispenser with a sink-top spout. Buy on Amazon. To install a hot water dispenser, the sink top must have a hole that can receive the spout. Most hot water dispensers are installed during kitchen remodeling in new sinks that have the proper number and configuration of holes needed. Can Your Sink Receive One of These? Though retrofits can be a little bit tricky, they’re not impossible. If your sink has a sprayer, you may be able to remove the sprayer and use the hole that it occupied. Or, if you have a separate spout for purified water, you can replace that one with a hot-and-cold model. Or, check to see if the sink has an extra hole that hasn’t been punched out yet. In a real pinch, you can have a plumbing contractor drill a hole in stainless steel or porcelain, though you risk cracking porcelain. A much easier and more affordable solution is to buy a countertop appliance that essentially does the same thing without the need for plumbing. 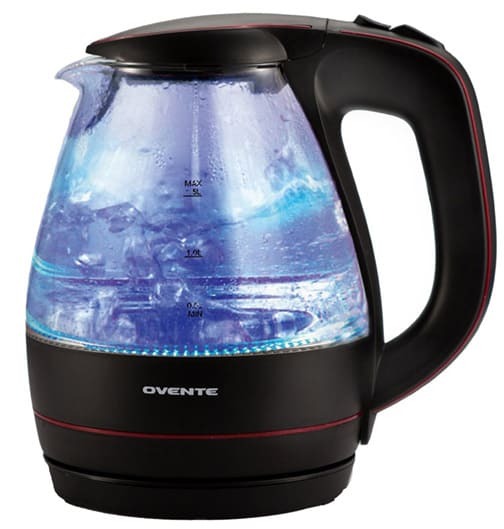 See Countertop Instant Hot Water Kettles & Appliances. Water dispenser fits into hole in sink rim. 1Insert the dispenser spout through the sink hole and tighten it in place from underneath with a large nut. Be sure to pay attention to the instructions for proper placement of trim, washers, and seals. 2Mount the tank onto the cabinet wall under the sink. 3Connect the tank to the water supply pipe. 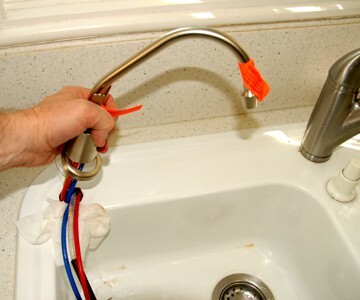 To do this, clamp a “saddle valve” onto the cold water pipe under the sink to tap into the water supply, and then connect the appliance to this valve with 1/4-inch copper tubing, using compression fittings. Plastic tubing simply plugs into the small electric heating unit under the sink. 4Connect the spout to the tank. The spout often has two plastic tubes—red for hot and blue for cold—that deliver water from the tank. Simply plug these into connectors in the top of the tank unit. 5Most appliances have a three-pronged plug that you just plug into a grounded, 15-amp receptacle (in some cases, they may share the receptacle used by a garbage disposal, but be sure to follow the manufacturer’s directions and adhere to local building codes). This video shows how to install a water dispenser. Though it is specific to InSinkErator, one of the popular brands, techniques are similar to most brands.